Do you straighten your hair? If you do, you will definitely want to read Liliya’s review of a styling tool that made her hair straight, shiny, and even healthier looking. My hair is not naturally straight, nor is it curly; it has this useless wavy quality that is probably the worst – you either have to curl it or straighten it. 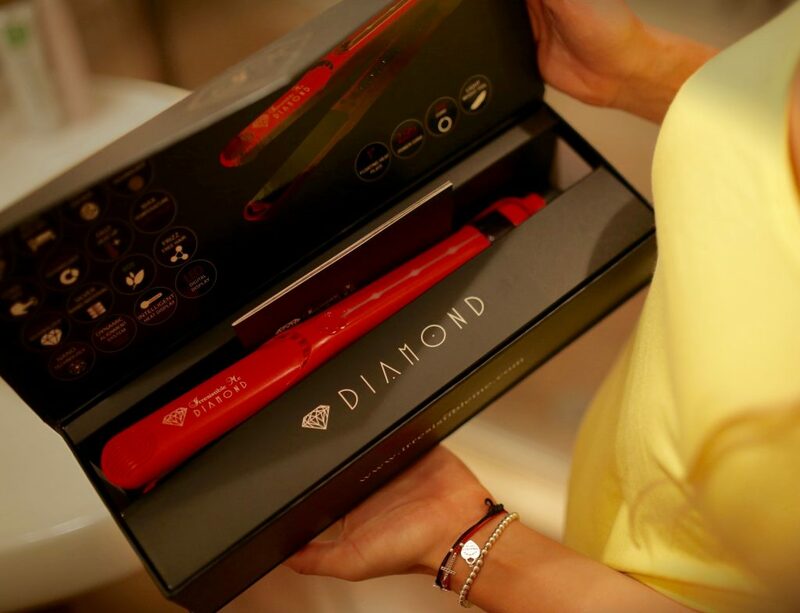 And so I was really excited to try out The Diamond Professional Flat Iron sent to me by Irresistible Me for my honest review. To start off, the iron looks and feels awesome. The handle is in a conveniently located, and it’s pretty light and easy to use. I didn’t find the thumb grip super convenient since I never put my thumb there, but maybe it’s just me. Another really important feature is the intelligent heat display that lets you see the temperature at all times and buttons located on the inside so that I don’t accidentally turn it off. It’s so much better than my curling device, which I often turn off without noticing and then get upset when it’s suddenly cold. Either that or I accidentally switch the temperature from the its lowest setting to a higher one – that one goes up to 400! I also have mention that the iron came in a very pretty box. I have a soft spot for boxes. In fact, my mom makes fun of me and accuses me of being a hoarder, since I’m always trying to come up with ideas on how to use them and avoid throwing them away. The box is not only designer-looking but can also be used to store the iron. That’s pretty convenient since it has a magnet lock and opens easily. I do wish, however, that it also came with a nice bag or cover for transporting the iron while traveling. Since blow drying can damage my hair, I only use a blowdryer when it’s unavoidable. So for styling with the flat iron, I waited until my hair was completely dry and then applied my heat protection spray. 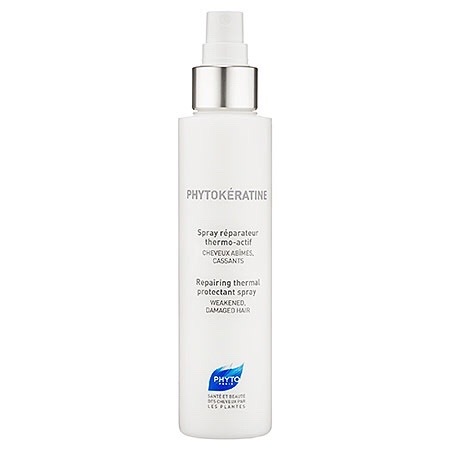 Our STYLetti partner-in-crime Julia recommended Phytokératine Repairing Thermal Protectant Spray which is thermo-active and thermo-protective. It repairs dry, damaged, and brittle hair and protects the hair from blow-drying and heat styling. This duo worked together perfectly. It felt really easy to straighten the hair. There was no pulling or discomfort and surprisingly enough, after styling with the iron, my hair looked healthier. I guess it was a combination of the keratin spray that seals moisture into the hair and the iron’s ceramic plates that are supposed to keep in the hair’s natural oils. My straight hair looked healthier and shined like a diamond – a huge improvement over my naturally dried hair! Would I use this iron? Yes! It’s great! I think for me the most important question is how to have beautiful hair without damaging it tremendously. And the answer is right in front of me. 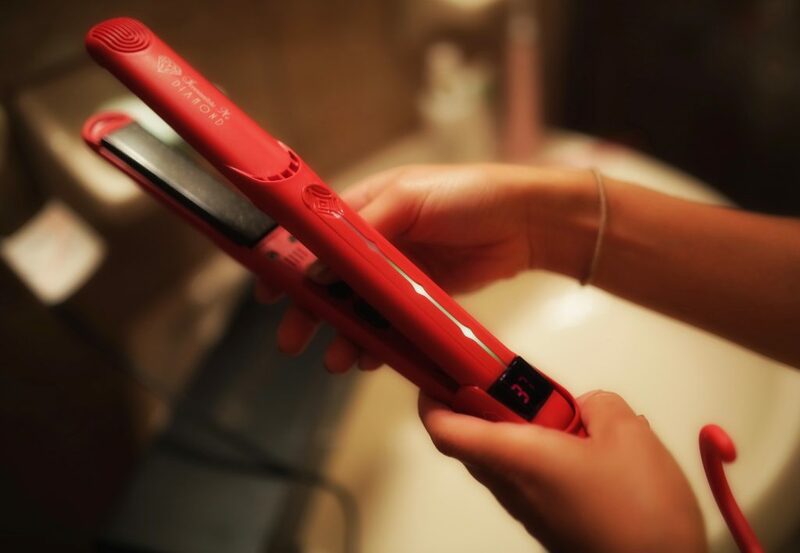 Common sense tells me that heat styling can damage hair, but while styling my hair with this hair straightener, I felt like contact with the plate was minimal; my hair was perfectly straight after going over it only once. And I feel that the spray did its job too. Overall, I loved my straight hair look, and I didn’t have that guilty feeling that I might have been damaging my hair while styling it. It felt and looked healthier – and much softer too. Loved it! Liliya you look really beautiful!! You look great also with straight hair? Did you like the spray? It smells so good; it just blows me away, love it! Stay beautiful? Please try to curl your hair using a flat iron! Thank you, Julia. Yes, I love the spray – it does smell good. And I will try to use the iron for curling! ? This is really lovely! I love your detailed review; you seemed to do it effortlessly, and you look so pretty, dear. Nice one! 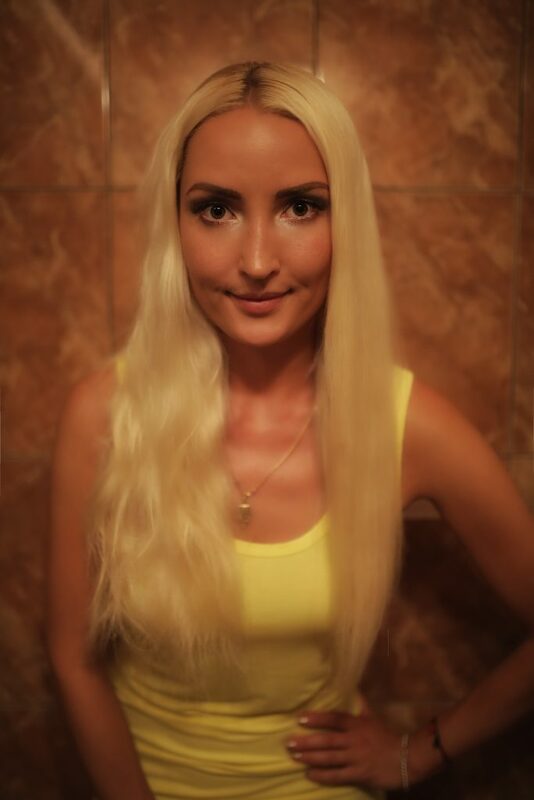 Straight hair looks great on you, Liliya.